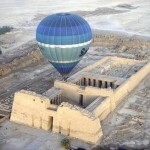 Breakfast; visit Egypt’s most loved sight – The Great Pyramids of Giza. We explore the Giza plateau, pyramids and massive lion-headed Sphinx. Later, we tour Sakkara – an ancient necropolis with many half-buried tombs and the famous Zhoser’s step pyramid. Transfer from Luxor Airport to the cruise ship. 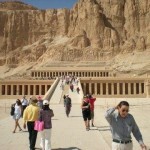 Cross the Nile to visits the West Bank of Luxor including the Valley of the Kings, the factory of the Alabaster Stones then the Temple of Queen Hatshepsut at Deir El-Bahari and the two Statues of colossi of Memnon. 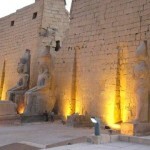 Sail to Esna Lock, Cross Esna Lock and sail to Edfu. Prices are quoted in US Dollars per Person per Package. What is the budget of this Tour? Students are accepted only if they hold Isic international Student Identity Card or younger than 12 years and they should have improve document to show them age at entrance fees tickets office. How much is the average Tipping and when to give it? On Average there are about 50 to 100 people working in the Hotel. The Guest sees only 5 or 7 persons of the crew. So it is unfair to give tips to people that you see and forget other people. That’s why there is a rule in all Hotels that Guest should not pay any tips for anyone during the stay. All Tips must be given at the end of your stay. You put your tips in an envelope and write the amount on the back then leave it at the Reception of your Hotel. 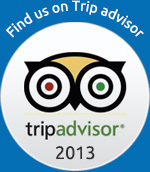 All Tips will be collected from clients and divided to the whole Hotel Staff. This is a Fair solution for everyone. 2 US$ x 2 Nights x 2 Person = 8 US$. So you Leave 8 US Dollars in an Envelope at the Reception on the End of your stay at the Hotel in the checkout time. 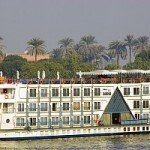 On Average there are about 50 to 70 people working in the Nile Cruise boat. The Guest sees only 5 or 7 persons of the crew. So it is unfair to give tips to people that you see and forget other people. That’s why there is a rule in all Nile Cruises that Guest should not pay any tips for anyone during the Nile Cruise Trip. All Tips must be given at the end of your trip. You put your tips in an envelope and write the amount on the back then leave it at the Reception of your Nile Cruise. All Tips will be collected from clients and divided to the whole Cruise Staff. This is a Fair solution for everyone. 3 US$ x 4 Nights x 2 Person = 24 US$. So you Leave 24 US$ in an Envelope at the Reception on the End of your Nile Cruise Trip. The following amounts are Recommended and on a Per Person Basis (in American Dollars USD). Tips are not an obligation on you. It is redemption for a good service. However wages in Egypt are very low. So most people depend on tips to survive, but this is not an excuse to give a bad service. If you feel that the person is not offering you a good service or stressing you to give him tips, DO NOT GIVE TIPS or REDUCDE THE AMOUNT. But please tell him why you did that. In most cases if you don’t give tips, people such as Driver, Cruise Staff, Felucca Captain or Carriage Car Driver will think that you gave the tips to your guide to give it to them and will start a Hard Talking with him about that and waste your time.